You can easily use Doodle’s meeting scheduler to schedule your meetings in minutes. 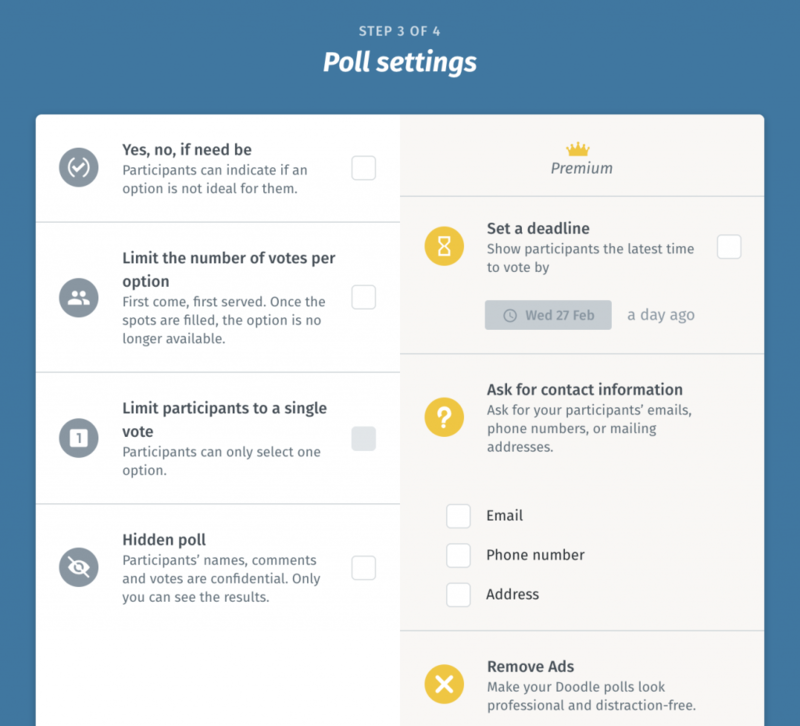 Create a poll and send it off to your participants to let them choose the best time to meet. In minutes you’ll have found the best time for everyone to meet, regardless of how big the group is! It’s possible to use Doodle polls for more than just meetings and scheduling; you can use them for surveys, questionnaires, or to book appointments. Get started now and try it out for yourself or read on for more awesome information. Doodle is the perfect tool for organization and planning. It’s easy to use – just take a look below to be walked through the steps. How do I use Doodle’s meeting scheduler? It’s easy to get started with Doodle. From the home page, you can start a trial and have full access to all the great features and benefits of Doodle. Try out Premium features like limited or hidden polls, poll deadlines, or additional information requests. Best of all Premium Doodle is totally ad-free for you and your participants. Or add your own logo and a custom background for a professional touch. 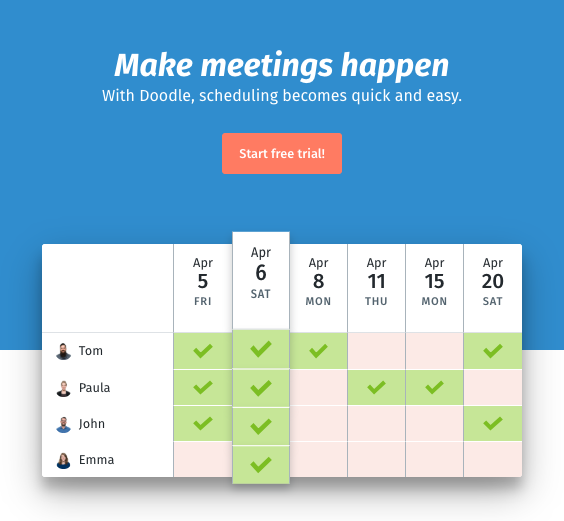 Doodle is the preferred meeting scheduler for busy people. Use it to schedule meetings with clients, colleagues, and teams! First, start your Doodle poll by choosing ‘create a Doodle’ at the top of the page. On the first step include the name of the meeting, the location of the meeting, and any notes that are important for the meeting. We’ll use ‘Board meeting’ for this one. The location is ‘our offices’ and we added a little note, which would be to look over the agenda beforehand. For more tips on how to have great meetings take a look at Doodle Blog. 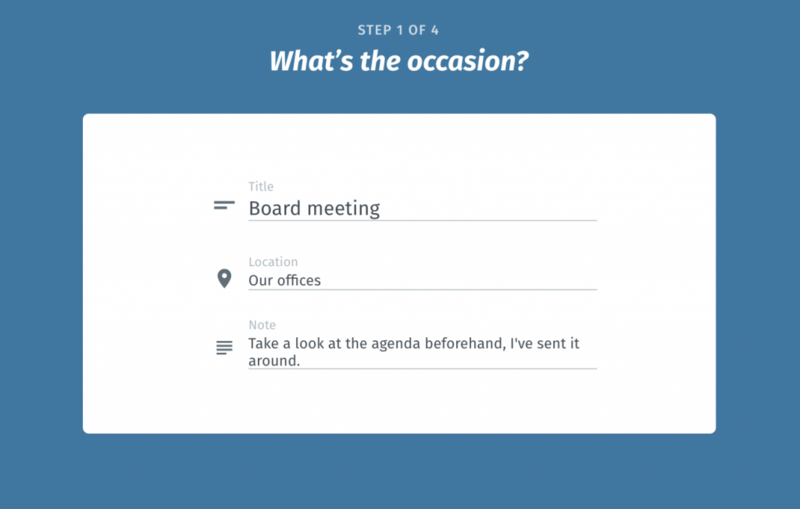 Second, you can add all the potential time options to your meeting invitation. It’s best to include several to ensure that our guests or participants can find the best time for their meeting. You can choose from the month view or the week view to do so. 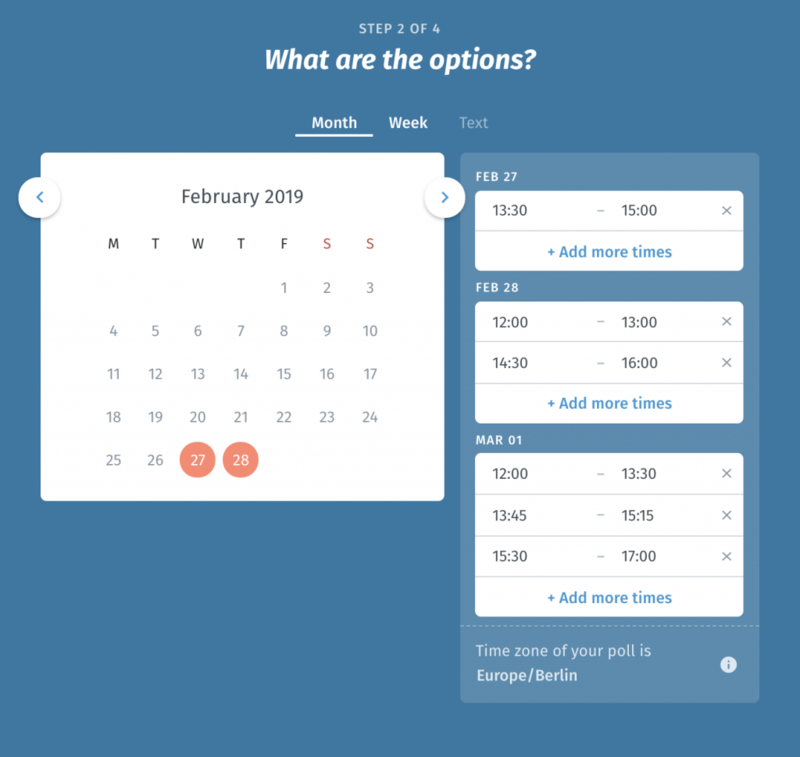 The week view will show you the entire week, and if you’ve connected your calendar to Doodle, which you can do with a free account, you’ll be able to see your appointments right next to your time options to make sure you don’t double-book, or over-book yourself. If you choose the month view, you’ll be able to see an entire month for a wider perspective on date selection. Third, you can find all the important settings for creating a Doodle poll. Choose yes, no, if-need-be, limited options, or make the Doodle poll hidden for example. Here you can also see several Premium Doodle options such as poll deadlines and additional information requests. Last, be sure to add your name, your email, and then send the Doodle you’ve created out to your guests. Add their email addresses to the box to send out the invites. Or you can share the link to the poll. They can vote on the dates that best fit their schedules and in minutes you’ve found the best time to for your meeting. It’s as simple as that! When all the votes are in you can choose the final date and close the poll to let everyone know. Doodle is the best way to schedule meetings! Doodle is a perfect choice for users who already use calendar software to organize their business or personal life. Doodle connects with Google Calendars, Office 365, Outlook.com and iCal. Be sure to connect your calendar for increased productivity and greater transparency when organizing meetings.